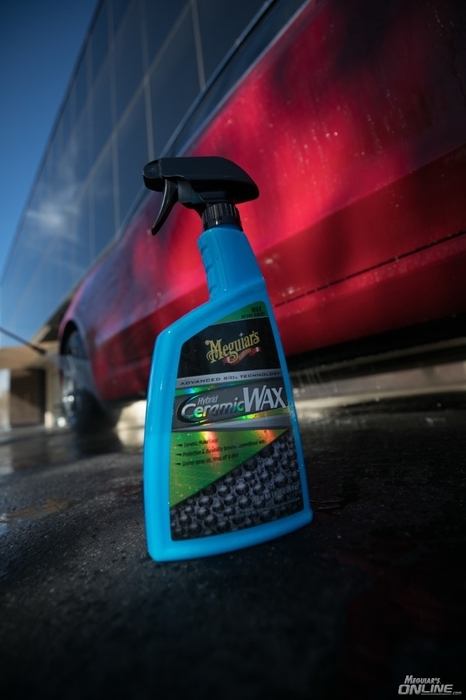 Thread: How to use Meguiar's NEW Hybrid Ceramic Wax! 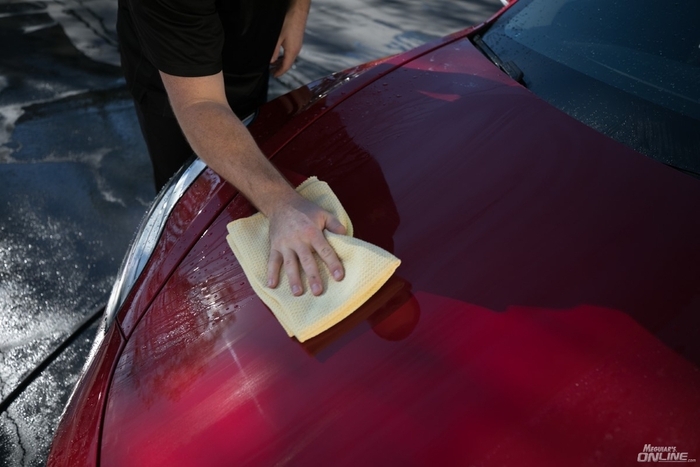 Meguiar's Hybrid Ceramic Wax is a very easy way to get durable Si02 / polymer blended protection on your vehicle. 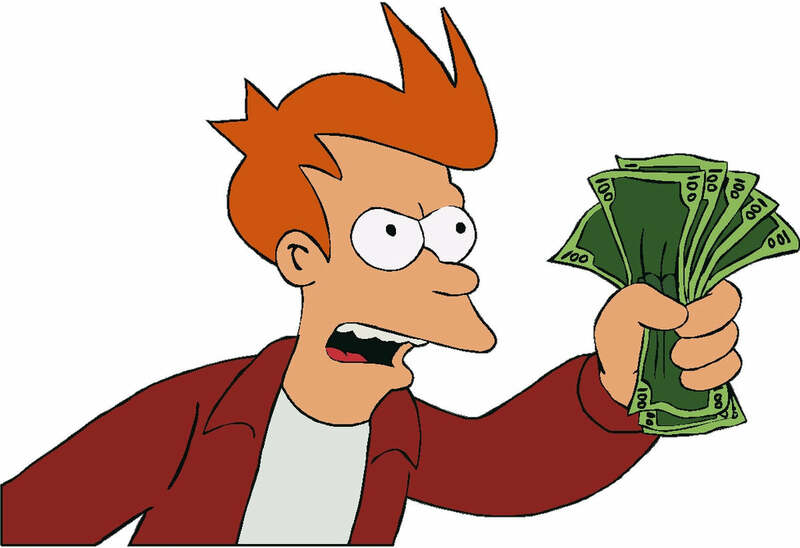 We have been getting a lot of questions on application, so this article will walk you through our recommendations. 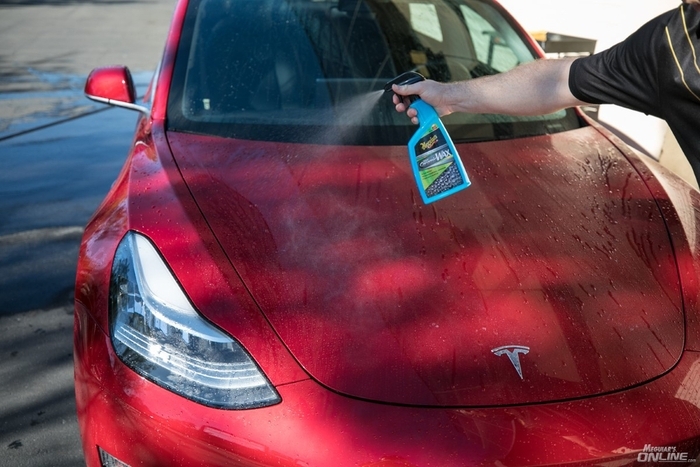 Hybrid Ceramic Wax can be used as your main source of protection, but here at Meguiar's and for most of you enthusiasts which are likely reading this, we like to use it and suggest using it in addition to your favorite wax/sealant, or even on top of a coating. 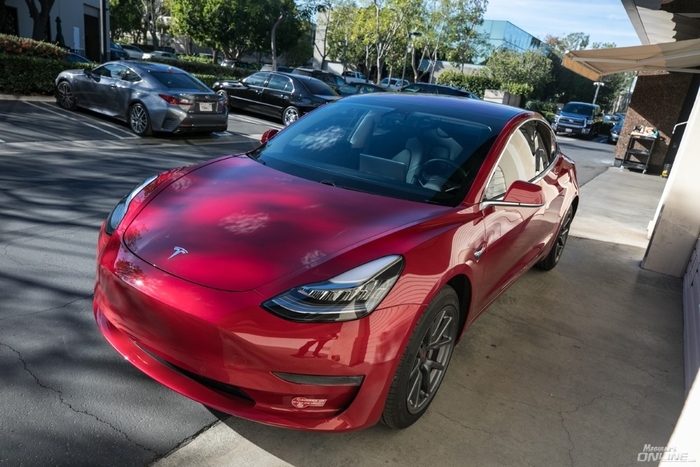 We borrowed an employee's super cool Tesla Model 3 to make this article. We started with a traditional wash, using the two bucket wash method. Washing of course, removes all loose contaminants. After washing the vehicle thoroughly, & before drying, spray Hybrid Ceramic Wax across all exterior surfaces. 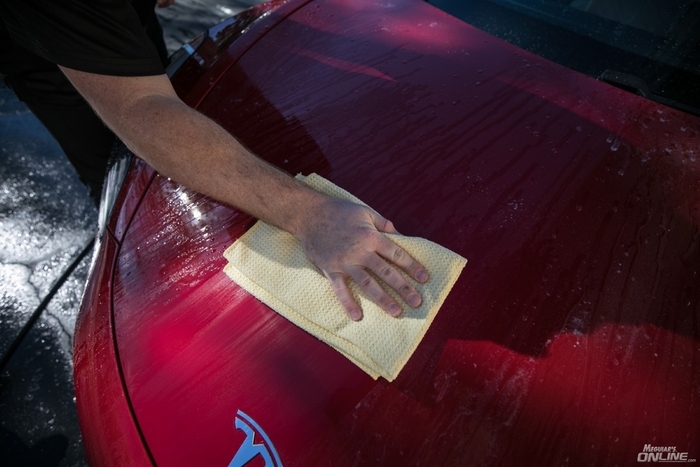 Next, simply dry vehicle normally with a quality microfiber drying towel like our X2000 Water Magnet Microfiber Drying Towel and you are done! 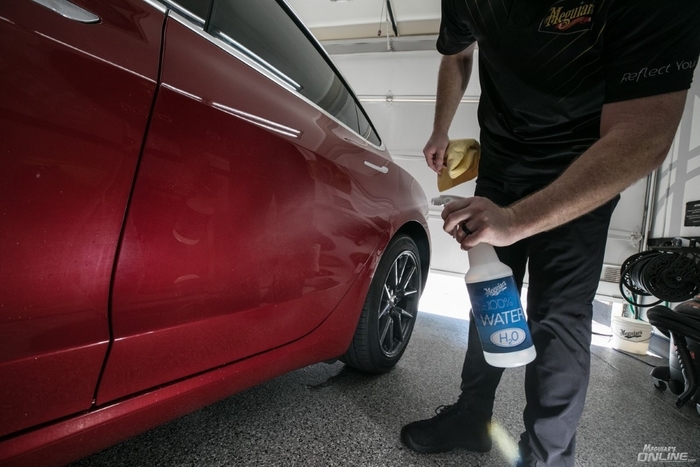 This initial "Wax as you dry" application method helps to get Hybrid Ceramic Wax into all of the nooks and crannies found on a microscopic level of the paint/clear coat. This method will make sure that ample product is applied to the surface so that subsequent uses have a nice even, level layer to adhere to. Hybrid Ceramic Wax loves to be layered (and can be combined with waxes and sealants)! 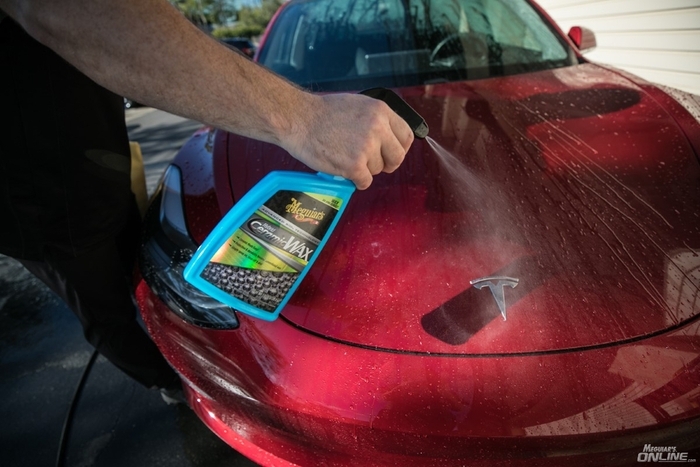 After you have used Hybrid Ceramic Wax for the first time, for subsequent applications, you can now apply it in a "wax as you rinse" style, an even easier application method. After washing the vehicle thoroughly, but before rinsing for the final time, spray Hybrid Ceramic Wax over all exterior surfaces. Next perform the final rinse on the vehicle rinsing from the top down. 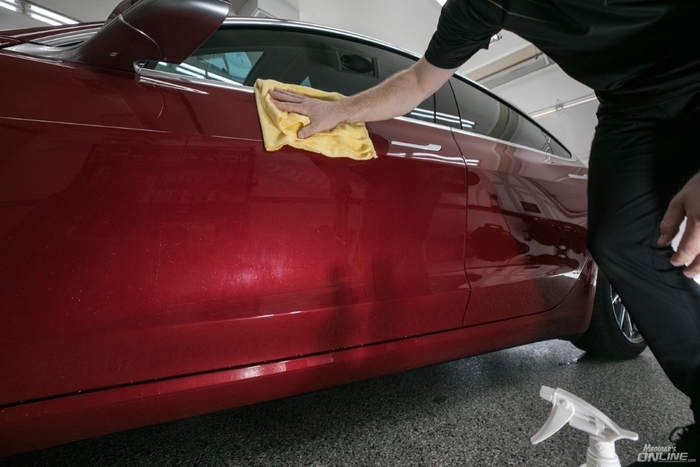 It is recommended to use a strong stream of water for the final rinse as this helps spread Hybrid Ceramic Wax across the exterior surfaces. We are using a pressure washer, since we have one, for the final rinse. If you don't have a pressure washer, use a strong stream from your water hose for this final rinse. Next, dry the vehicle normally & you are done! 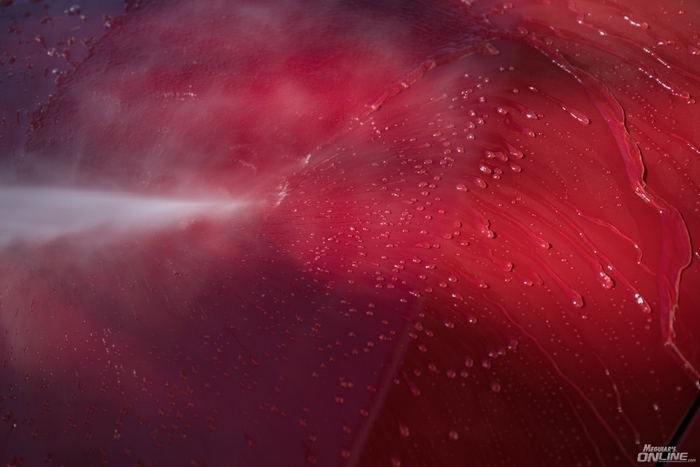 PRODUCT STREAK REMOVAL - Damp Towel or Mist of Water - For the below picture we intentionally let the product dry on the surface, to demonstrate how the product can leave a streak if improperly allowed to dry. This can happen by leaving the product on the surface for too long before drying with a towel, or from working in direct sunlight. TO REMOVE - If this does happen to you, simply wipe area with a w/ a microfiber towel damp with water, or spray a light mist of water onto the streak, and then wipe with a microfiber towel. This will easily remove the streak. We hope you enjoy Meguiar's new Hybrid Ceramic Wax as much as we are! Please comment if this article was helpful and/or post any questions within this thread. Re: How to use Meguiar's NEW Hybrid Ceramic Wax! Yay am I the first reply?? Thanks for the tutorial Nick! This product is many forum members, myself included, been waiting for! Answers a LOT of questions that I, along with probably many others have. Now to get some and give it a try. That is if Spring will ever come this year. Is there any harm in using it as a wax as you dry product every time? No harm in using it every time you wash. Our marketing team will thank you for doing so! It’s more of a question of if its ok to use it every time as if it’s the initial application and never using as a wax as you rinse product. Still ok? How is this going to look compared to Ult. 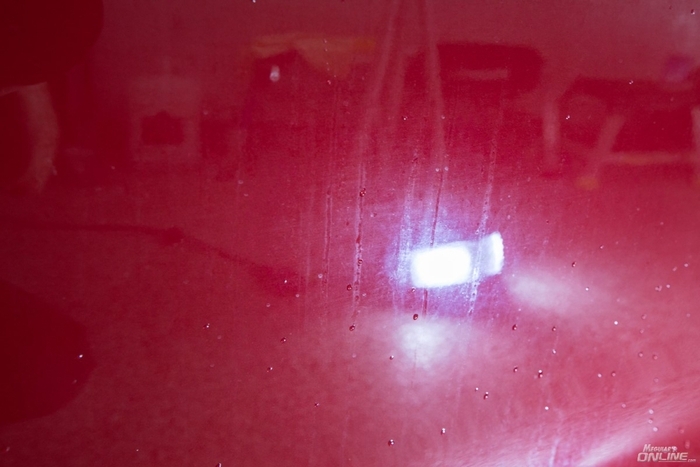 Quick Wax used after washing... Is there a difference in looks, or durability? Technically, yes, but if you over apply it (too many sprays per panel) it might become trickier to dry without streaking. Rinsing is really the preferred method for proper distribution of the product. If you're going to do it very regularly though, you can get away with a bit less product to make that drying process easier. And honestly, if you're going to get any streaking at all, it's going to be most noticeable on black paint but it's easily avoided by just not over using the product. We know a lot of people have the mind set that "if some is good, more is better" and they tend to hose it on!!! UQW has a pretty good ability to hide minor defects, which this probably won't do to the same extent. This won't darken paint like UQW or Ultimate Liquid/Paste or Gold Class, but it does tend to make the paint feel really slick. Durability is going to be better than UQW or even ​Ultimate Liquid/Paste due to that SiO2 chemistry.